The American-Lights® UV Air Cleaner is professionally installed by a qualified contractor inside the air duct of heating, ventilation and air conditioning (HVAC) systems of home and offices and covers up to 5,000 square feet. By treating the air which passes through the HVAC system with ultraviolet light, you can effectively reduce or eliminate the DNA-based airborne contaminants - allergens, pathogens, toxins, asthma triggers - that cause allergy, asthma attacks, sickness and respiratory conditions. 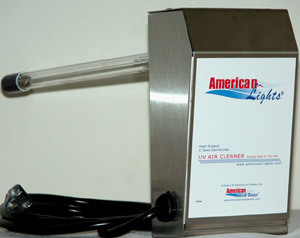 UV Air Cleansers have been used for decades. They have been tested and implemented by companies such as General Electric and Westinghouse. The UV air purification technology is used in hospitals, laboratories, clean rooms, doctors' offices, commercial buildings, food processing plants... any place a concern for clean air exists. Now this exceptional technology is available to the homeowners. * Based on time and UV intensity.